Bishop James S. Thomas was one of South Carolina’s most significant contributions to the United Methodist Church. His pioneering work helped lead to the end of racial segregation in the church’s hierarchy. Bishop James S. Thomas became the first African-American to receive an honorary doctorate from Wofford College on May 14, 1972. Bishop Thomas was born a hundred years ago this spring, on April 9, 1919, in Orangeburg. His father, the Rev. James S. Thomas, Sr., was a clergyman serving there. Bishop Thomas enrolled at Claflin University, graduating in 1939 with a degree in sociology. He first became an educator, spending a year as a school principal in Florence County. However, he could not ignore his call to the ministry, and was ordained deacon and elder in subsequent years. He attended Gammon Theological Seminary and served the Orangeburg Circuit, and later, earned a master’s degree at Drew University. Back in South Carolina, he served two years on the York Circuit, and was also a chaplain at South Carolina State College. From the local church, Bishop Thomas found a calling in higher education, going on to become a professor at Gammon Seminary. While there, he earned his PhD in sociology and anthropology at Cornell University. During part of his time at Gammon, he served as acting president of the seminary. In 1953, he took a position as associate general secretary of the Methodist General Board of Education, with responsibilities for assisting and supporting the denomination’s historically black colleges. He served at the General Board for a dozen years, retaining his clergy membership in the South Carolina 1866 Conference. During the 1950s, many Methodists began to question the bargain that had been struck during the reunification of the northern and southern branches of Methodism, the bargain that relegated African-American Methodists into the segregated Central Jurisdiction. As early as 1952, Methodists were arguing that “there is no place for racial discrimination or segregation in the Methodist Church.” In a painfully slow manner, Bishop Thomas was at the forefront of helping to dismantle segregation in the church. Though the Central Jurisdiction still existed in 1964, Thomas was elected to the episcopacy by the North Central Jurisdiction. He became the youngest Methodist bishop at the time of his election. He was assigned to the Iowa Area, one of the largest annual conferences in the denomination, where he served until 1976. During that twelve years, the merger with the Evangelical United Brethren Church created the United Methodist Church, the Central Jurisdiction was abolished, and former African-American conferences throughout the country merged into integrated conferences. During that twelve years, Bishop Thomas became president of the Council of Bishops, served as chair of the social principles study commission, and delivered the principal episcopal address in 1976. In 1972, in fact, three native South Carolinians played leading roles in General Conference, one of them being Bishop Thomas. Claflin remained dear to his heart, and he helped the university raise funds on numerous occasions. A long-time trustee, he chaired the board and was inducted into the Claflin hall of fame. He also received honors from colleges across the Midwest, including Ohio Wesleyan, Iowa Wesleyan, and DePauw, and in South Carolina, both Claflin and Wofford conferred honorary doctorates on him. 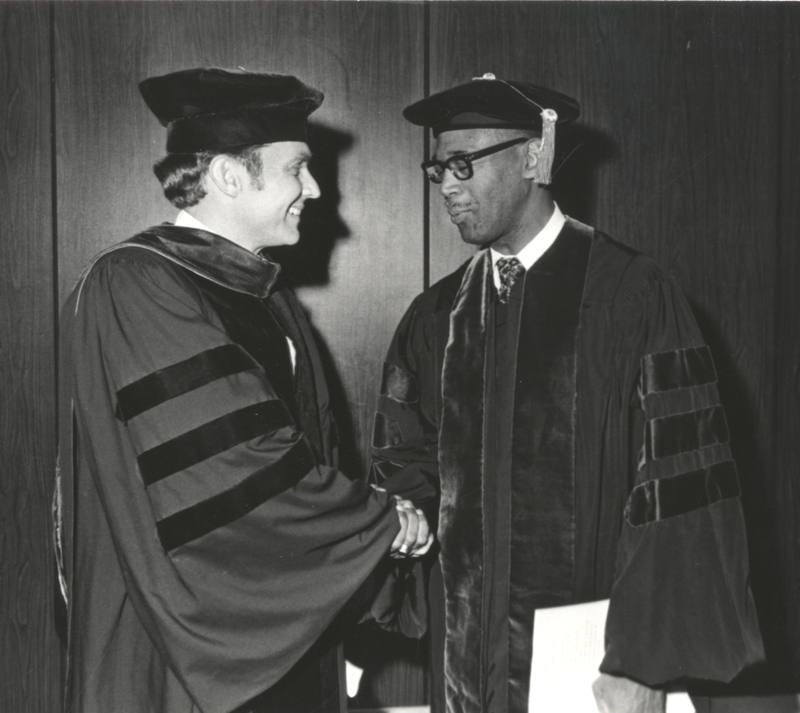 He was the first African-American to receive an honorary degree from Wofford in 1972. In 1976, he was appointed to the East Ohio Conference, where he served until retirement in 1988. He continued his ministry as a bishop in residence at Emory and at Clark Atlanta, and continued his work of mentoring and teaching until his death in 2010 at age 91.